Mirzaee, M., Najar Peerayeh, S., Ghasemian, A. (2014). Detection of icaABCD Genes and Biofilm Formation in Clinical Isolates of Methicillin Resistant Staphylococcus aureus. Iranian Journal of Pathology, 9(4), 257-262. Mohsen Mirzaee; Shahin Najar Peerayeh; Abdol-Majid Ghasemian. "Detection of icaABCD Genes and Biofilm Formation in Clinical Isolates of Methicillin Resistant Staphylococcus aureus". 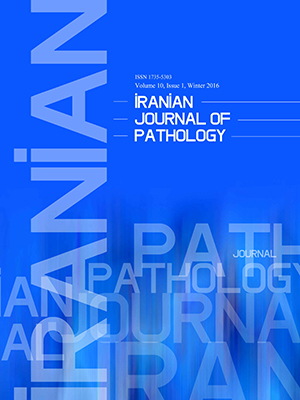 Iranian Journal of Pathology, 9, 4, 2014, 257-262. Mirzaee, M., Najar Peerayeh, S., Ghasemian, A. (2014). 'Detection of icaABCD Genes and Biofilm Formation in Clinical Isolates of Methicillin Resistant Staphylococcus aureus', Iranian Journal of Pathology, 9(4), pp. 257-262. Mirzaee, M., Najar Peerayeh, S., Ghasemian, A. Detection of icaABCD Genes and Biofilm Formation in Clinical Isolates of Methicillin Resistant Staphylococcus aureus. Iranian Journal of Pathology, 2014; 9(4): 257-262. Background & Objectives: Methicillin resistance Staphylococcus aureus (MRSA) is one of the most important pathogens that causes several nosocomial and community infections. Adhesion to surfaces and biofilm formation is considered main step in staphylococcal infection. The aims of this study were to determine presence oficaABCD genes and relation to the biofilm formation in of MRSA isolates. Methods: Of the 63 MRSA clinical isolates collected from selected hospitals in Tehran, Iran,quantitative biofilm formation was determined by microtiter tissue culture plates (MtP). All MRSA isolates were examined for determination the icaABCD genes by using PCR method. Results: twenty nine (46%) of the isolates were strong produced biofilm on Mtp. All of the MRSA isolates carried icaD and icaC genes, whereas, the prevalence of icaA and icaB was 60.3% and 51% respectively. Conclusions: S. aureus clinical isolates have different capacity to production biofilm and adhesion. This may be caused by a different in the expression of biofilm genes and hetrogenicity in genetic origins. Havaei S, Azimian A, Fazeli H, Naderi M, Ghazvini K, Samiee SM, et al. Genetic Characterization of Methicillin Resistant and Sensitive, Vancomycin Intermediate Staphylococcus aureus Strains Isolated from Different Iranian Hospitals. ISRN Microbiol. 2012 20;2012:215275. Hiramatsu K, Hanaki H, Ino T, Yabuta K, Oguri T, Tenover F. Methicillin-resistant Staphylococcus aureus clinical strain with reduced vancomycin susceptibility. Antimicrob Agents Chemother 1997;40 (1):135-6. Nathan K, Mark J, William C, Jeff G, Mary E, Mark E. Staphylococcus aureus biofilms, Virulence. Virulance 2011;2 (5):445–59. Cramton S, Gerke C, Schnell N, Nichols W, Gotz F. The intercellular adhesion (ica) locus is present in Staphylococcus aureus and is required for biofilm formation. Infec immune. 1999;67 (10):5427-33. Gamal F, Mohamed A, Mostafa S, Mona A, Hassan A, Rehab M. Detection of icaA, icaD genes and biofilm production by Staphylococcus aureus and Staphylococcus epidermidis isolated from urinary tract catheterized patients. J Infect Dev Ctries 2009; 3 (5):342-51. Glowalla E, Tosetti B, Kronke M, Krut O. Proteomics-based identification of anchorless cell wall proteins as vaccine candidates against Staphylococcus aureus.InfectImmun 2009;77 (7):2719–29. Donlan RM, Costerton JW. Biofilms: survival mechanisms of clinically relevant microorganisms. Clin Microbiol Rev 2002;15(2):167-93. Deighton MA, Capstick J, Domalewski E, van Nguyen T. Methods for studying biofilms produced by Staphylococcus epidermidis. Methods Enzymol 2001;336:177-95. Arciola CR, Campoccia D, Gamberini S, Cervellati M, Donati E, Montanaro L. Detection of slime production by means of an optimised Congo red agar plate test based on a colourimetric scale in Staphylococcus epidermidis clinical isolates genotyped for ica locus. Biomaterials 2002;23(21):4233-9. Hassan A, Usman J, Kaleem F, Omair M, Khalid A, Iqbal M. Evaluation of different detection methods of biofilm formation in the clinical isolates. The Brazilian journal of infectious diseases : an official publication of the Brazilian Society of Infectious Diseases. 2011;15(4):305-11. Ruzicka F, Hola V, Votava M, Tejkalova R, Horvat R, Heroldova M, et al. Biofilm detection and the clinical significance of Staphylococcus epidermidis isolates. Folia Microbiologica 2004;49(5):596-600. Stepanovic S, Vukovic D, Hola V, Bonaventura G, Djukic S, Cirkovic I, et al. Quantification of biofilm in microtiter plates: overview of testing conditions and practical recommendations for assessment of biofilm production by staphylococci. APMIS 2007;115 (8):891-9. Rohde H, Knobloch J, Horstkotte MA, Horstkotte M, Dietrich M. Correlation of Staphylococcus aureus icaADBC genotype and biofilm expression phenotype. J Clin Microbiol 2001;39 (12):4595–6. Kiem S, Oh WS, Peck KR, Lee NY, Lee JY, Song JH,et al. Phase variation of biofilm formation in Staphylococcus aureus by IS256 insertion and its impact on the capacity adhering to polyurethane surface. J Kore MedSci 2004;19 (6):779–82. Rachid S, Ohlsen K, Wallner U, Hacker J, Hecker M, Ziebuhr W. Alternative transcription factor B is involved in regulation of biofilm expression in a Staphylococcus aureus mucosal isolate. J Bacteriol 2000;182 (23):6824-6. Cramton S, Ulrich M, Götz F, Döring G. Anaerobic conditions induce expression of polysaccharide intercellular adhesin in Staphylococcus aureus and Staphylococcus epidermidis. Infec immune. 2001;69 (6):4079-85. Eftekhar F, Dadaei T. Biofilm Formation and Detection of IcaAB Genes in Clinical Isolates of Methicillin Resistant Staphylococcus aureus. Iran J Bas Med Sci 2011;14:132-6. Pozzi C, Waters E, JKRudkin, Schaeffer C, Lohan A, Tong P, et al. Methicillin Resistance Alters the Biofilm Phenotype and Attenuates Virulence in Staphylococcus aureus Device-Associated Infections. PLoS Pathog 2011;8(4):e1002626. Lauderdale K, Malone C, Boles B, Morcuende J, Horswill A. Biofilm dispersal of community-associated methicillin-resistant Staphylococcus aureus on orthopedic implant material. J Orthop Res 2010;28 (1):55-61. Atshan S, Shamsudin M, Sekawi Z, Lung LT, Hamat R, Karunanidhi A, et al. Prevalence of Adhesion and Regulation of Biofilm-Related Genes in Different Clones of Staphylococcus aureus. J Biomed Biotechnol 2012;10:1-12. Yazdani R, Oshaghi M, Havayi A, Pishva E, Salehi R, Sadeghizadeh M, et al. Detection of icaAD Gene and Biofilm Formation in Staphylococcus aureus Isolates from Wound Infections. Iran J Publ Health 2006; 35 (2):25-8.